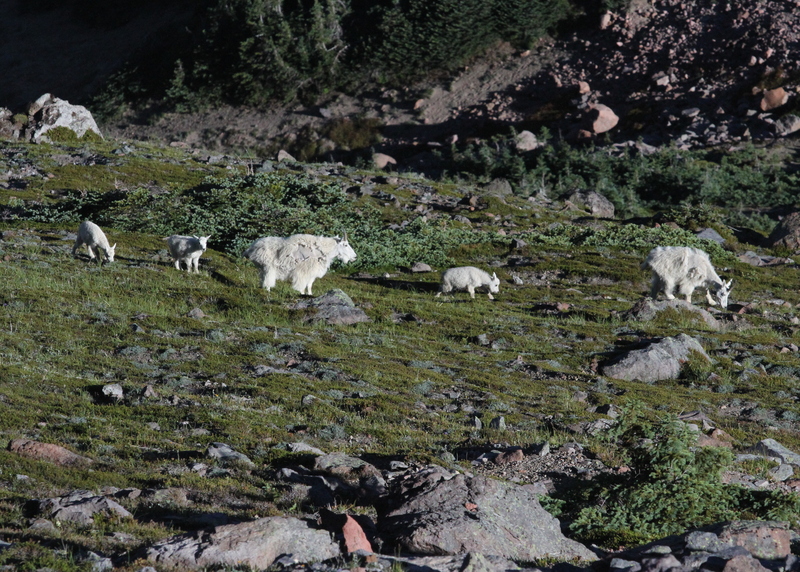 One of the thrills of my Mount Rainier trip was all the wildlife that I got to see and capture in my pics. I shared a few stories already on Facebook, but now I have the pics that go with those stories. 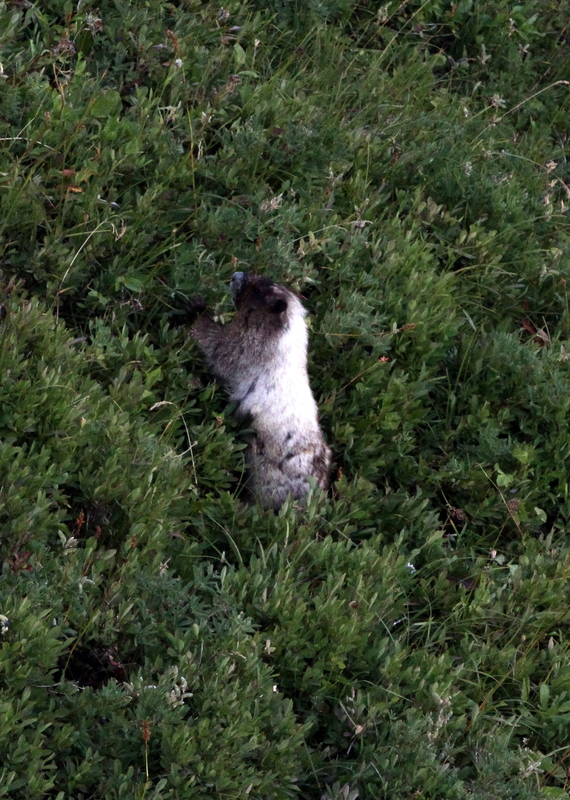 I had never seen a Marmot before, but my experience this weekend would lead me to believe they are pretty common. I think I saw six different ones and got pictures of several. The most intriguing thing was that for two of them, I slipped up on them unaware and I got pictures of them gazing out over the beautiful view from their mountain top perches. The first was on Saturday morning shown below. 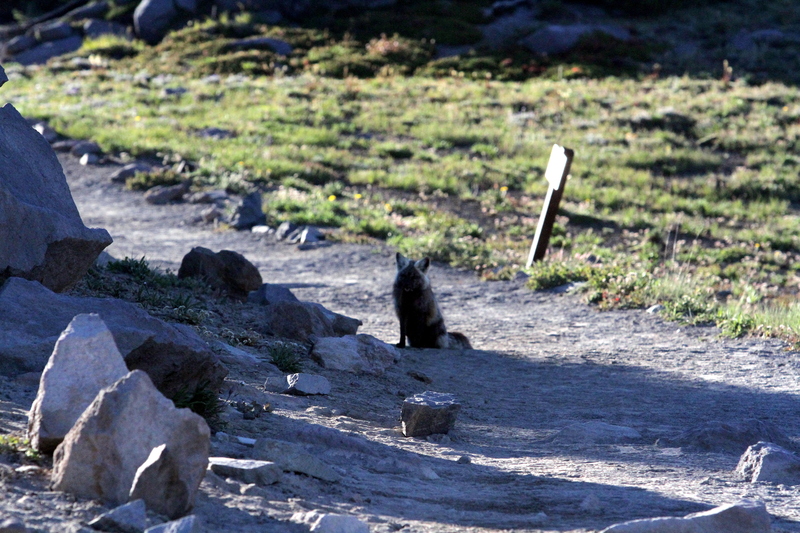 Coming down the mountain I happened upon this Marmot taking in the scenery. I happened upon a similar scene in Sunrise the next day. 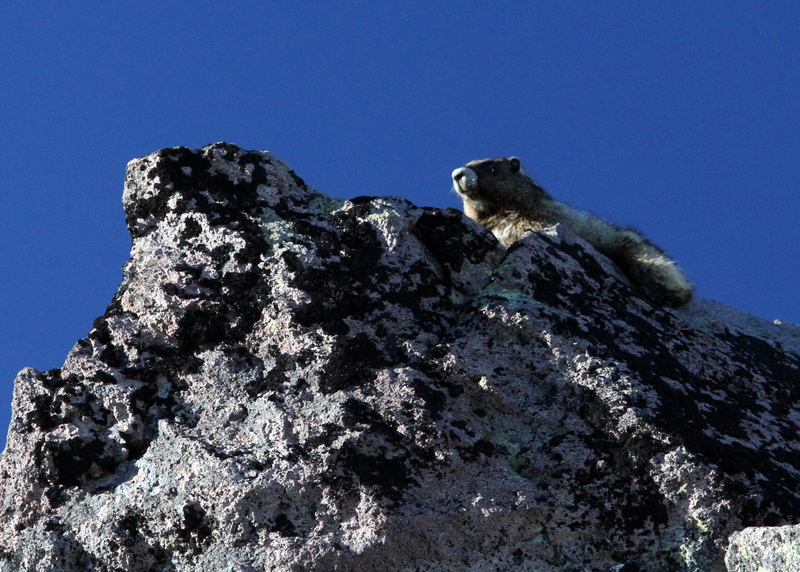 Even the Marmots appreciate the wonder of God’s creation. 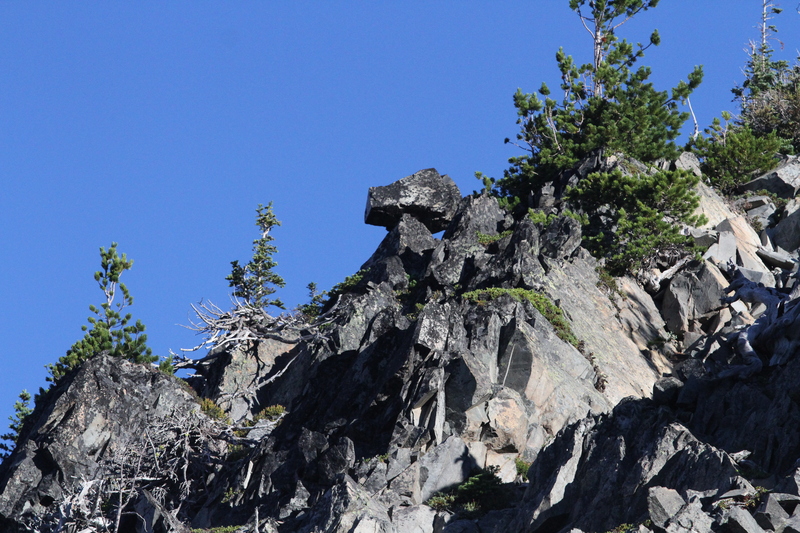 This fellow was on a rock outcropping on the side of Pinnacle Peak gazing out toward Mount Rainier. As I moved down the trail this fellow slipped down into the brush on the side of the mountain and began picking fruit off the plants. 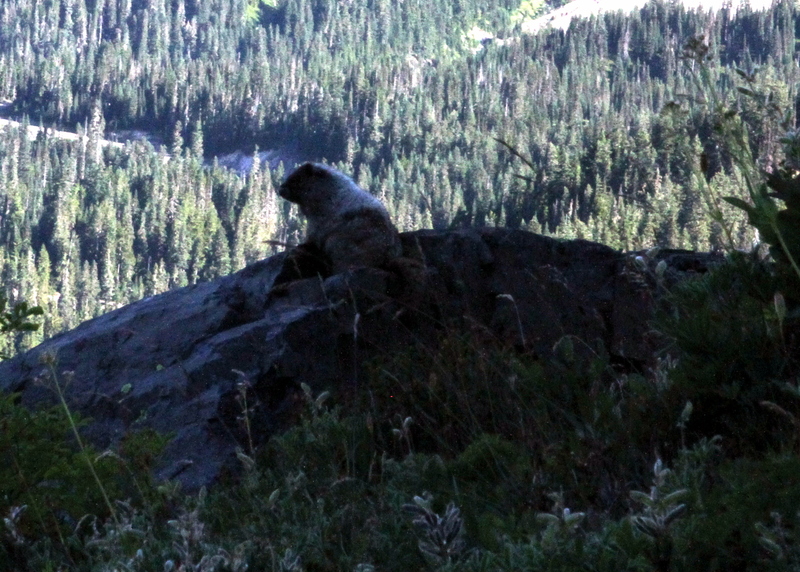 One of several Marmots I got pictures of while hiking. Early mornings are the best time to view the wildlife. After taking this picture I looked around to see if I could identify what he was eating. I saw what appeared to be blueberries and in my enthusiasm I quickly picked one and popped it in my mouth. As it entered my mouth I realized I really didn’t know what it was I was about to ingest, so I quickly spit it out. Visions of me writhing in the middle of a mountain trail because I had eaten a poisonous berry freaked me out just a little. 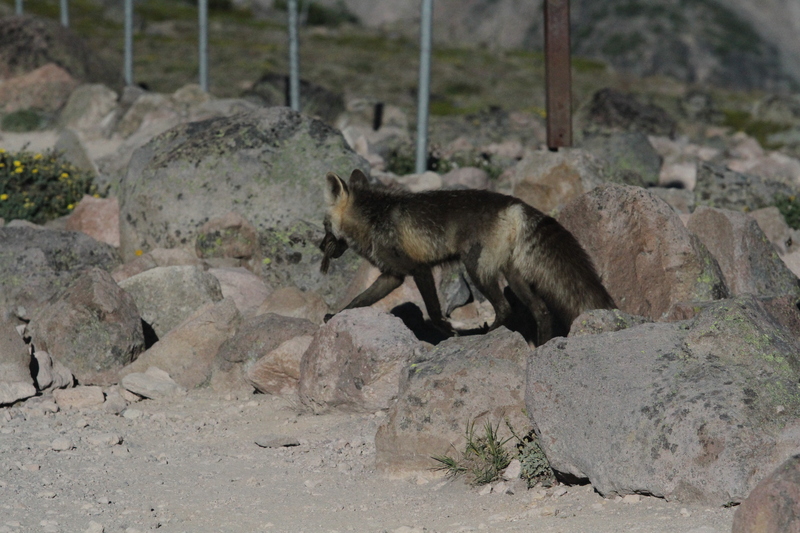 As I headed down the mountain I got into the forest and I came upon a couple stopped by the trail eating something. The woman about my age asked me if I had eaten my share of blueberries. THEY WERE BLUEBERRIES! A juicy, sweet mid-morning snack along the trail. 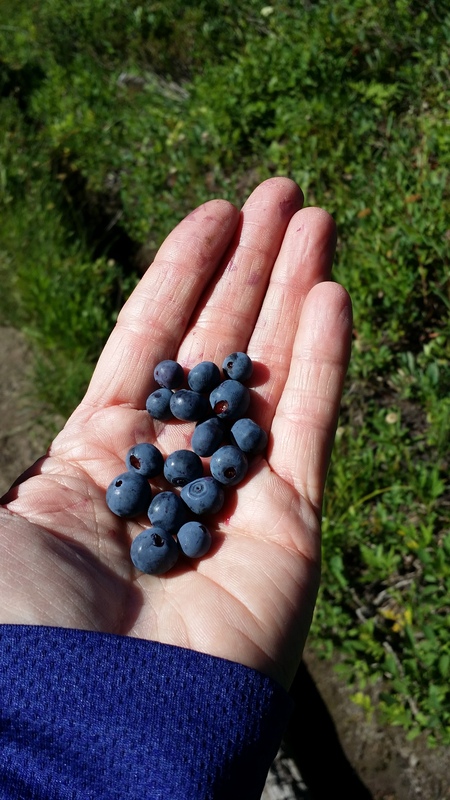 It was an absolute delight finding the blueberries ripe and within reach all along the lower part of the trail. 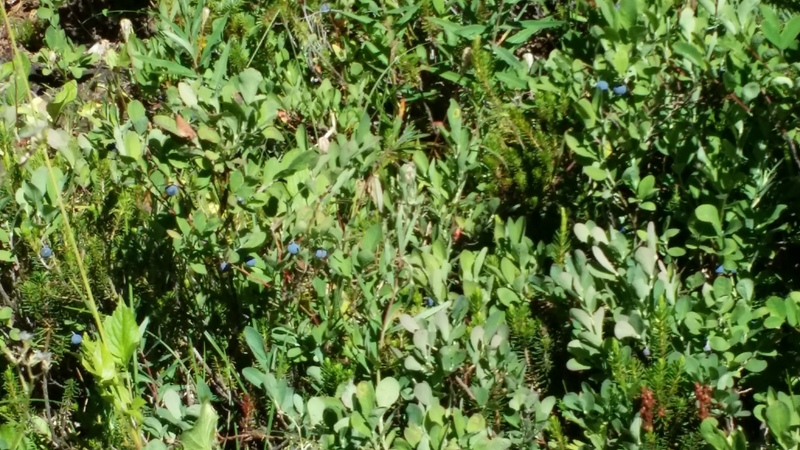 Finding the blueberries almost put me into sensory overload. All five of my physical senses had been saturated. The sights were phenomenal as I have tried to capture with these pictures. The smell of the forest of fir and spruce brought on nostalgic thoughts of Christmas. From the howling of the coyotes to the crunch of rocks underfoot to the bird song all along the trail my ears were filled with the sounds of nature. What was missing was the man-made noise of cars and machines that so often fill our lives. The deep stretches of quiet were also a welcome respite to my sense of hearing which had become numb from the ever-present sounds of civilization. The chill morning air that caused my hands to seek my pockets or rub together was the first of many times my sense of touch was stirred. Sitting on the mountain top a gentle breeze caressed my sweating brow. As the day wore on and the miles hiked mounted, even the sore muscles reminded me I was doing something special. So the blueberries were just icing on the cake. The term ‘bursting with flavor’ literally came true as I snagged a second and then a third handful of plump berries and popped them in my mouth. 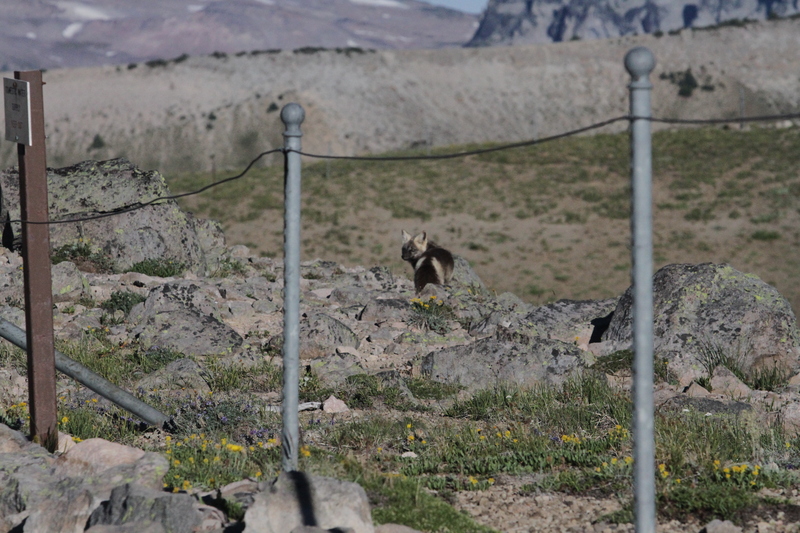 While I saw other marmots and lots of chipmunks through the day on Saturday, nothing prepared me for the 30 minute window early Sunday morning. 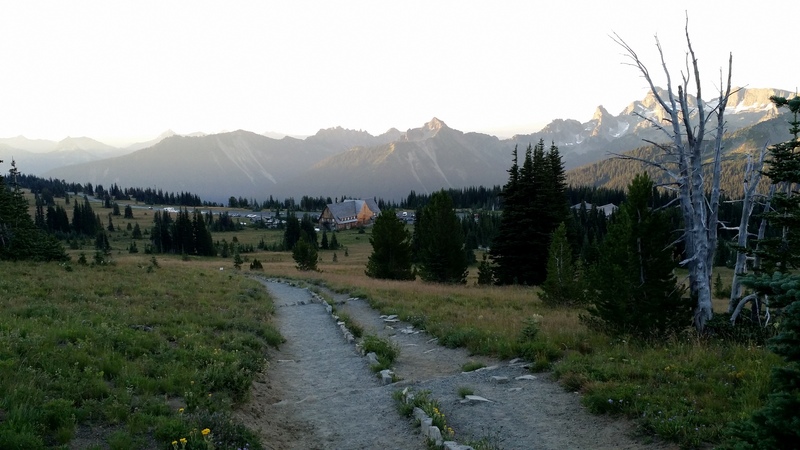 I took the trail from Sunrise up to the Sourdough Ridge and Wonderland Trail. I started a little before 6 am. 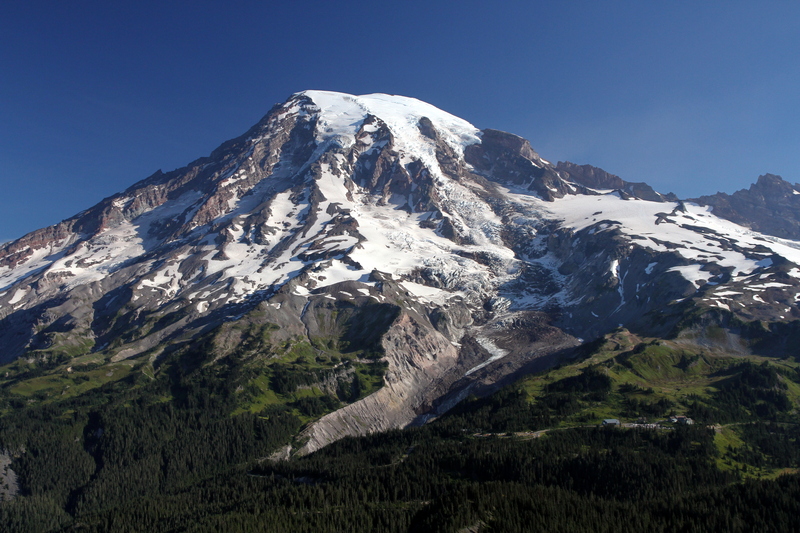 The visitor center and parking lot at Sunrise on the northeast side of Mount Rainier. I had my eyes peeled looking for wildlife. I had come upon a nice herd of elk in the dark as I was driving up the mountain so I was already primed. 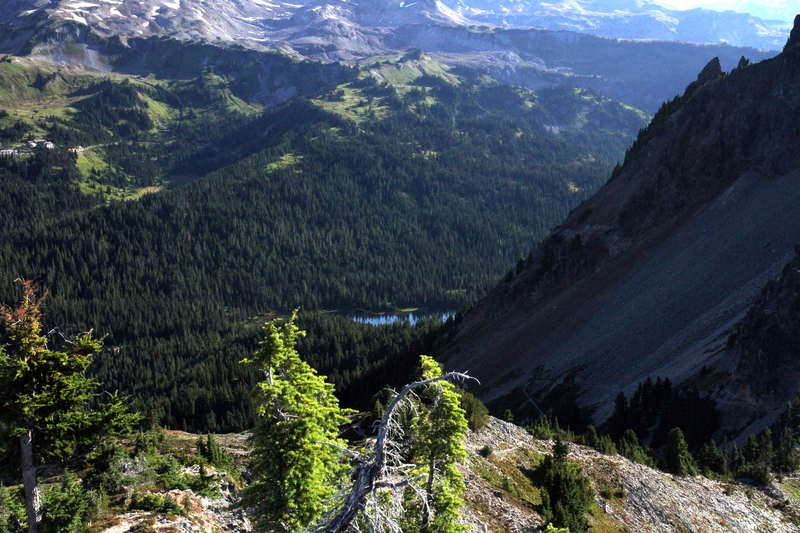 I scanned the beautiful valleys on either side of the trail as I headed toward Burroughs Mountain. 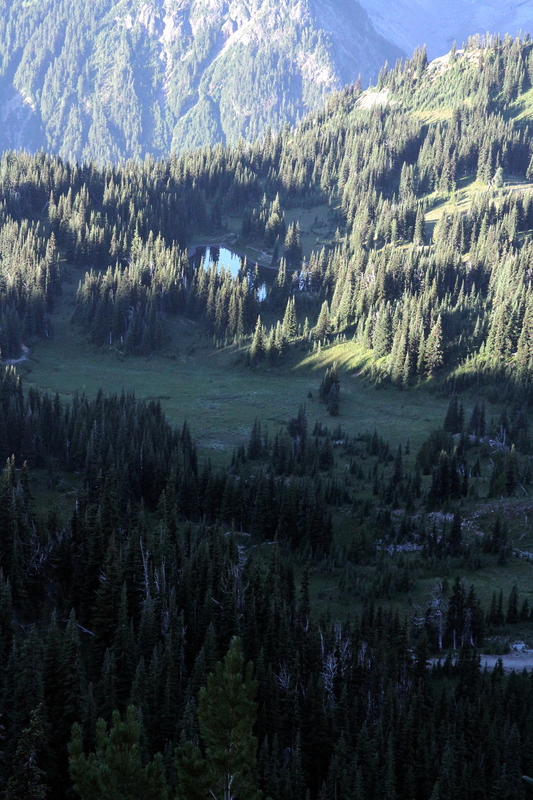 I kept expecting to see a herd of elk or deer stroll across one of the meadows below me. I did not see them, but at about the same time of the morning that coyotes were howling on the trail in front of me on Saturday, one or two raised a cry somewhere down close to the lake in this picture. I waited for a few minutes to see if they might break into the open, but they never did. Coyotes began howling down around that lake a mile or so away. After this I was on high alert. My head was on a swivel looking for wildlife. In fact I switched to my “big” lens to reach out and capture close up pics if possible. 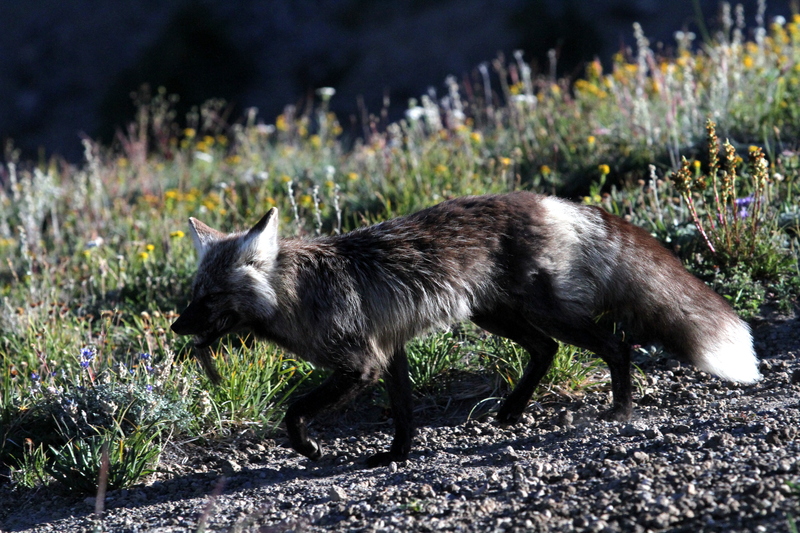 Shortly after the coyotes howled, as I approached the end of the Sourdough trail I saw movement ahead that appeared to be about the size of a dog. I snapped pics thinking that a coyote had crossed in front of me but the exposure was all wrong as the fleeting shape was lost in the shadow while my camera adjusted exposure to the light beyond. Balancing rock above the trail. I saw movement slink across the trail ahead of me just after taking this pic. I cautiously moved through the area where the “coyote” had slipped across the trail. 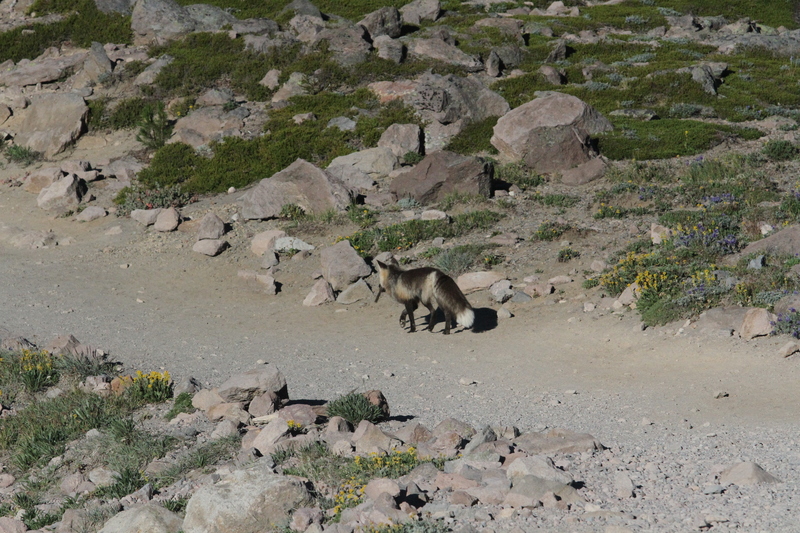 I thought that I should be able to see him since the area opened up into the wide open, tundra-like topography of Burroughs Mountain. Oddly enough I bumped into the Manager of the plant where I am working out on the trail just a few minutes after this. My friend trail running early in the morning at Sunrise. We chatted a bit and then I turned to point back where I had just come from and the direction he was heading to tell him to keep his eyes open for a coyote. And this is what we saw. We at first thought this was a coyote that for some reason was following me. We walked toward him to make him decide whether he wanted to take on both of us. Instead he decided since we weren’t going to get out of his way on the trail, he would just go around us. I believe he had caught a chipmunk just before I noticed him. I had come upon him quick enough that he slipped into cover in the few trees there so I passed by. But he had a home down the trail and we were simply in his way. I was surprised at his total lack of fear of us. With the big lens on I continued up the path. I stopped at one point a few minutes later to change lenses to my smaller lens to take landscapes, but I felt a prompting to leave on the big lens. Now let me interject briefly. I do not think I am special above anyone else. I am just a guy who loves the Lord and in my imperfect way, I try to follow and obey Him as best I can. However I do believe that God loves His children and enjoys our taking delight in Him and His creation. I personally believe God loves to hear His children laugh. So when I, in joyful exuberance, asked the Lord for some good pics of wildlife, I had faith I would get those shots. Now that was about 5 minutes before the encounter with the fox. So when I got the nudge to leave on the big lens, I did. As I tightened the big lens on my camera I looked up at the ridge overhead and this is what I saw. 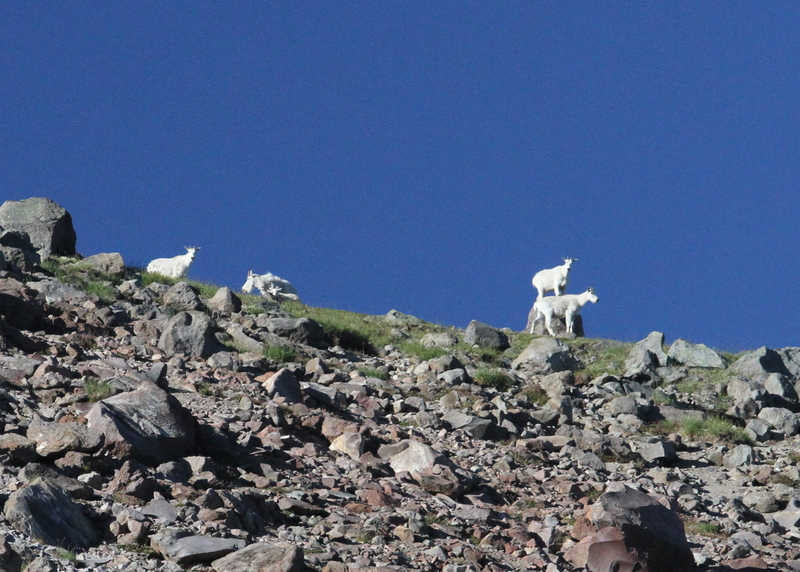 Mountain goats above me on Burroughs Mountain #1. At this point I am thanking the Father for the simple and fun blessings He has given me. But He was not through yet. 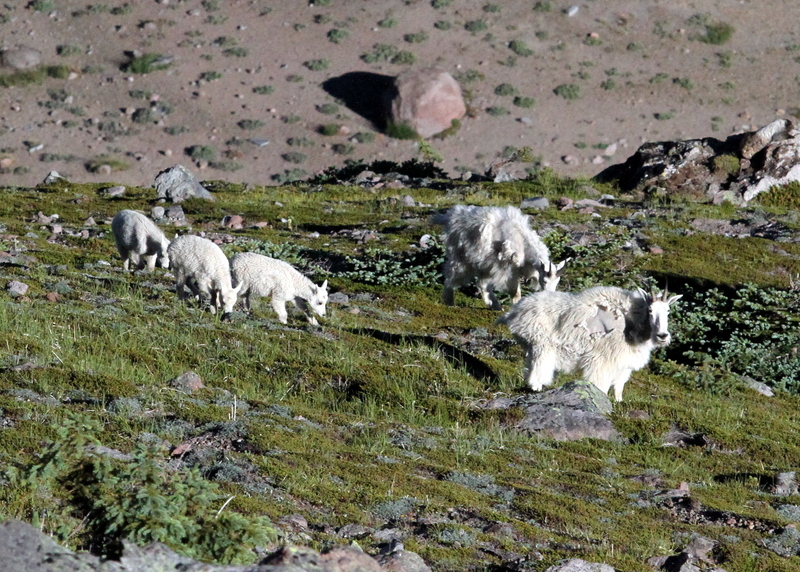 About 5 minutes later I looked down the slope and there is a family of mountain goats. At this point I was just plain thrilled. I remember telling the Lord, I was satisfied, that He had provided more than I had hoped for. But the surprises weren’t through quite yet. As I finally neared the top of Burroughs 1 I happened to look up. 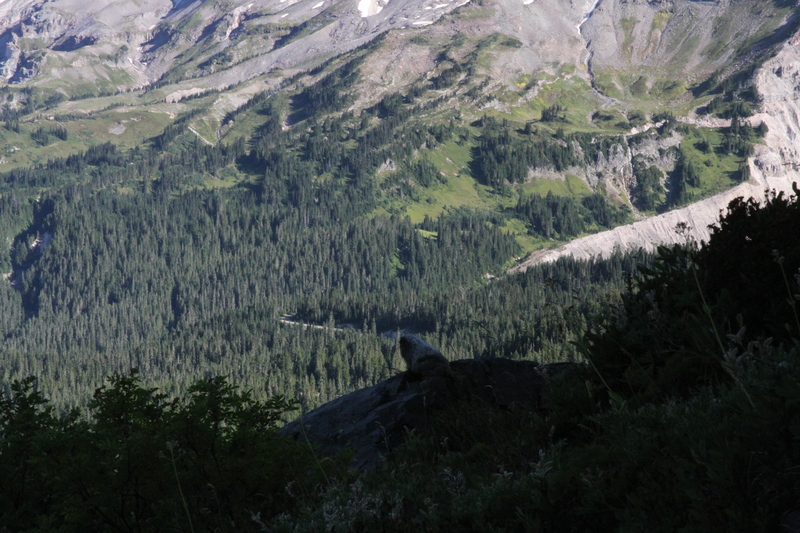 And there on an outcropping overlooking the broad valley below was a Marmot enjoying the view. My first thought was, I guess humans aren’t the only ones who can appreciate a beautiful view. Here is the view he was gazing at. It was funny to me. 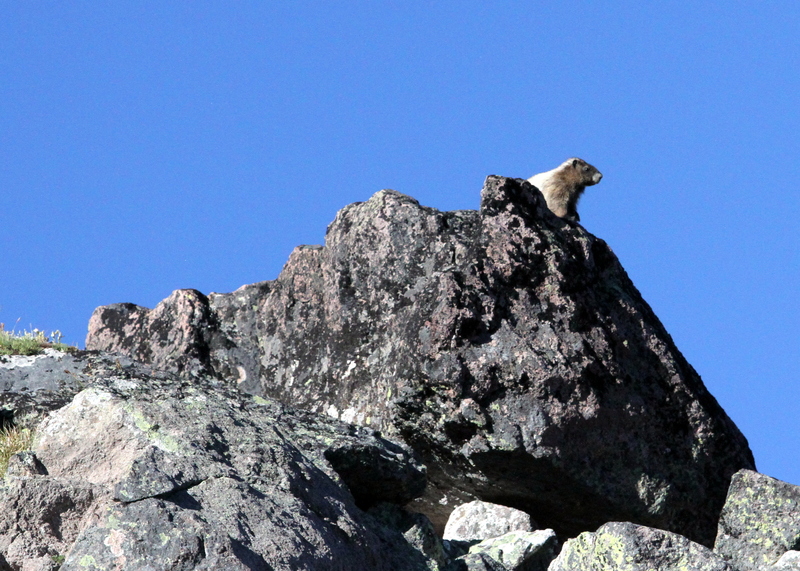 The Marmot reminded me of Mr Beaver in the CS Lewis book, “The Lion, the Witch, and the Wardrobe”. In the land of Narnia the animals talk. 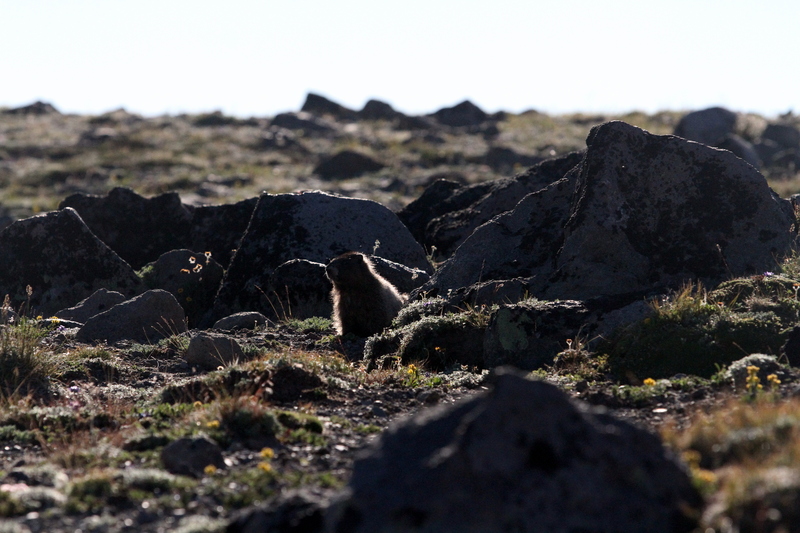 As the shutter on my camera snapped, the Marmot turned to look at me as if to say, “Why are you disturbing my morning meditation?” To which I apologized and quietly moved on. Psalm 104 perfectly fit this day. Verse 1 “Praise the LORD, my soul. Verse 24 “How many are your works, LORD! The final verses sum it up. 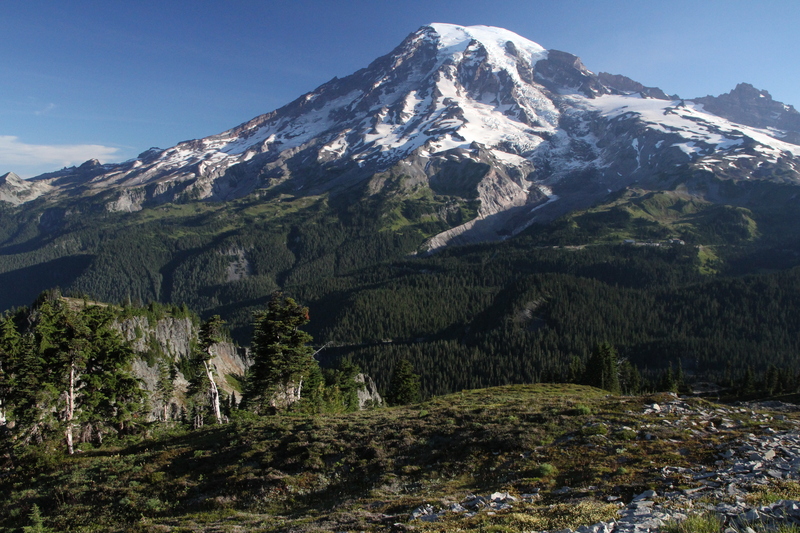 If you like the pics stay tuned for at least one more installment of Mount Rainer pics. Sunrise over Sunrise was absolutely magnificent. Pictures can’t fully capture it, but they do a pretty good job. Until next time, look to the LORD and enjoy His gracious mercy and love. 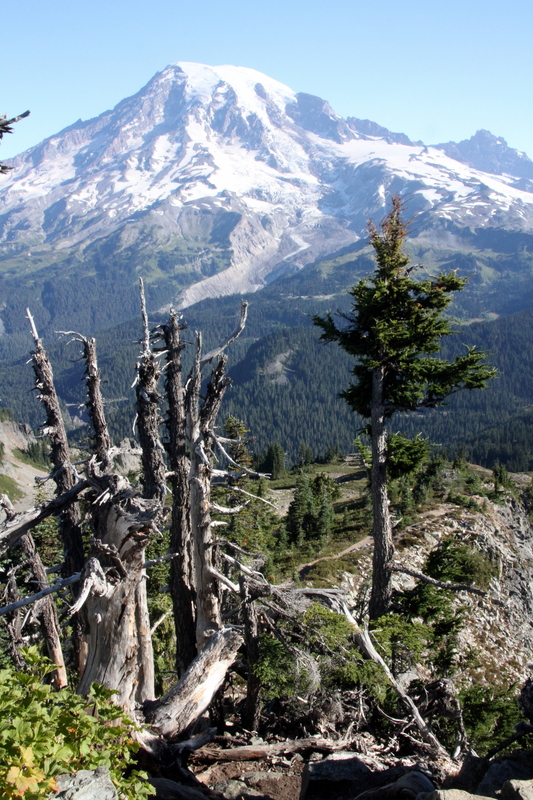 Panorama view of Mount Rainier taken from the top of Plummer Peak. 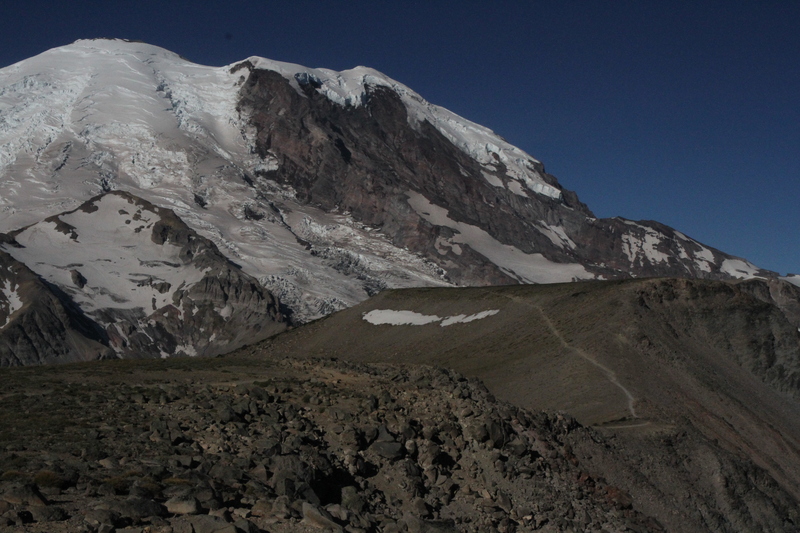 I had a spectacular time hiking Mount Rainier this past weekend. 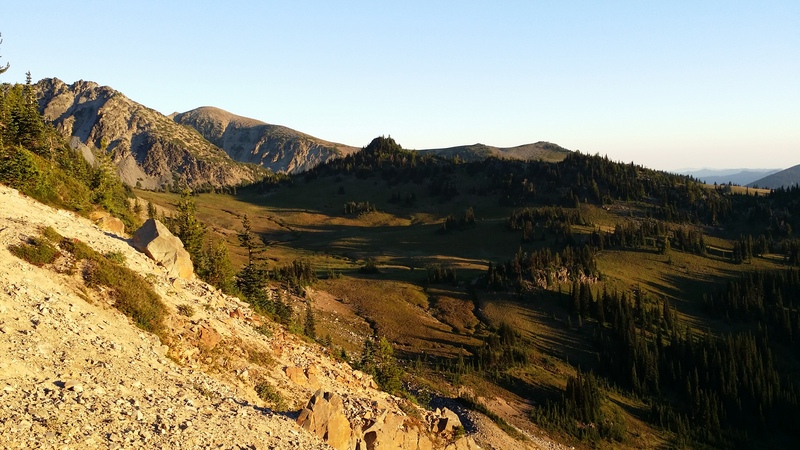 I drove up Friday evening and scouted out Paradise in preparation for an early morning rendezvous with the mountain. I was at Reflection Lake about 5 am on Saturday striving for the perfect shot as the sun first struck the mountain. I got some okay shots, but compared to the others I have selected, they don’t quite make the cut. 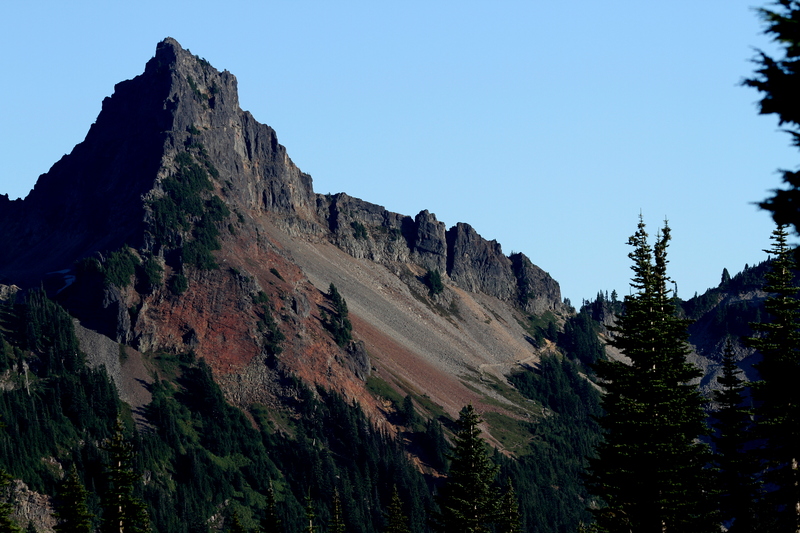 A little before 6 I hit the Pinnacle Peak Trail which begins across the road from Reflection Lake. About 15 minutes up the trail I heard coyotes begin howling. It’s a little unsettling to be alone on the trail and have four coyotes howling just a hundred yards or so ahead of you. Thoughts of being alone, remote, and surrounded by animals that eat meat… and realizing that to them I am meat, gave me reason to pause. I considered whether it would be prudent to turn around, but a brief prayer later I felt like the Lord was calling me higher. And I knew He was more than able to handle the coyotes. A little further up the trail I was struck by what a wonderful gift the Lord had given me. 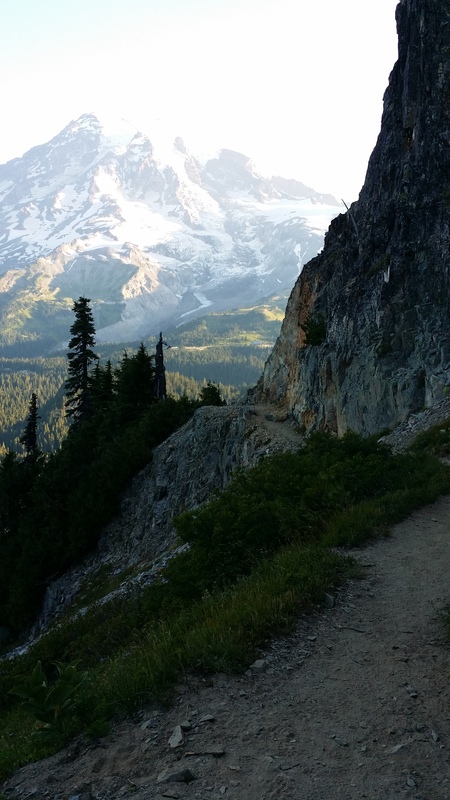 My new job was enabling me to hike in the Mount Rainier NP, take lots of photos, and worship Him all in one of the most beautiful places I have ever been. I realized that for most of my life I have been a Martha-like person, always busy DOING. See Luke 10:38-42. If I had not had the job change that I have, I would still be slaving away working crazy hours to put away “enough” money to retire in a few years. The Lord gently reminded me that He is able to supply all our needs. We don’t know how much is enough, but He does. The measure that really matters is not how much money we make or have, but how much of US we have surrendered to Jesus. Mary sat at Jesus’ feet and He commended her for it. This day as my heart was bursting with gratitude, I realized I was sitting beside Mary… and it was a wonderful place to be. Pinnacle Peak across the valley from Paradise. 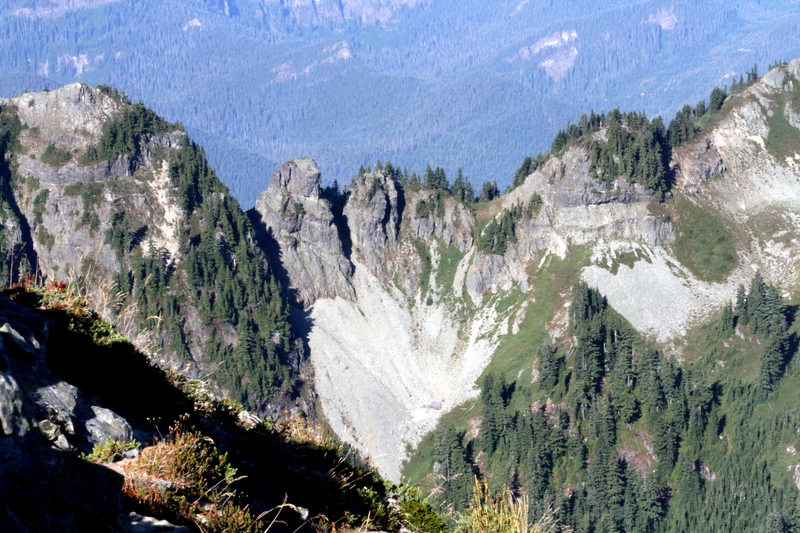 Note the Pinnacle Peak trail up the side of the mountain which is how I got to Plummer Peak. 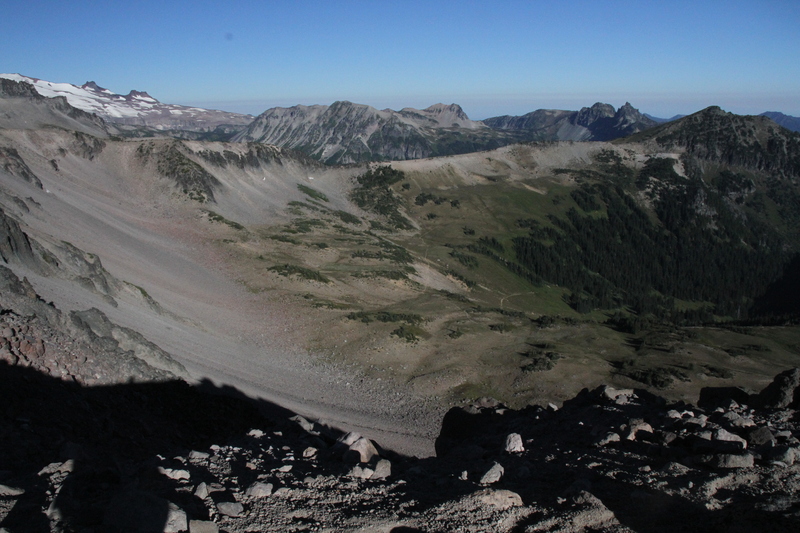 As I continued up the mountain I emerged from the forest out into my first scree field. You can see the trail I hiked in this picture. Pinnacle Mountain towered on my left and the jumble of rocks flowed steeply down the mountainside on my right. The views just kept getting better and better. This was my original destination until I felt the tug to “come up higher”. Plummer Mountain was my perch for an early morning devotional. 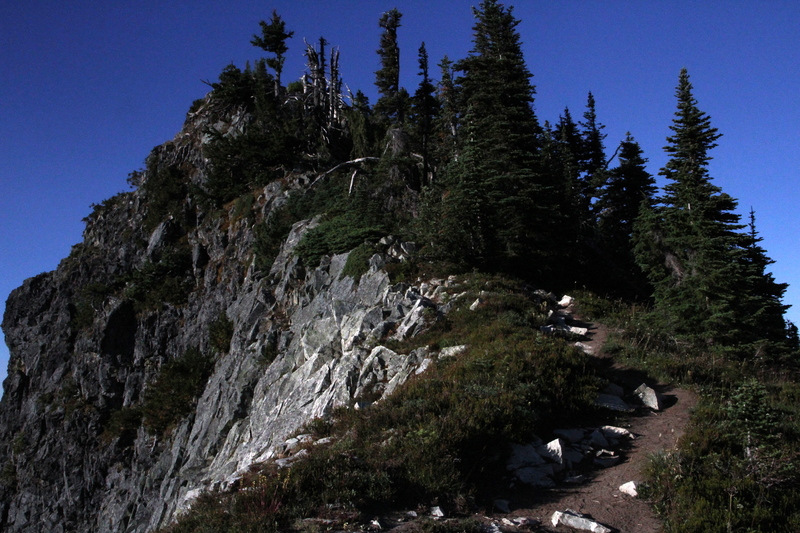 The maintained trail ended at the pass between Pinnacle Peak and Plummer Peak. 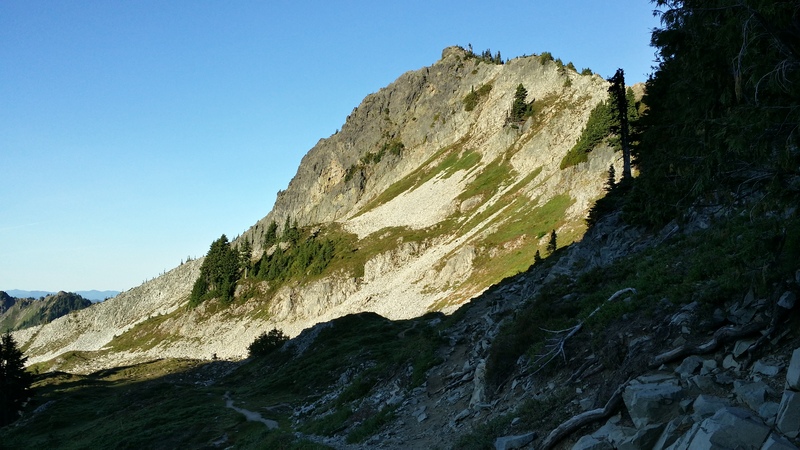 As I snapped pictures I noticed what looked like a trail heading over the Plummer Peak. About 20 minutes later I found myself on the very top of the highest rocks you can see on the mountain above. 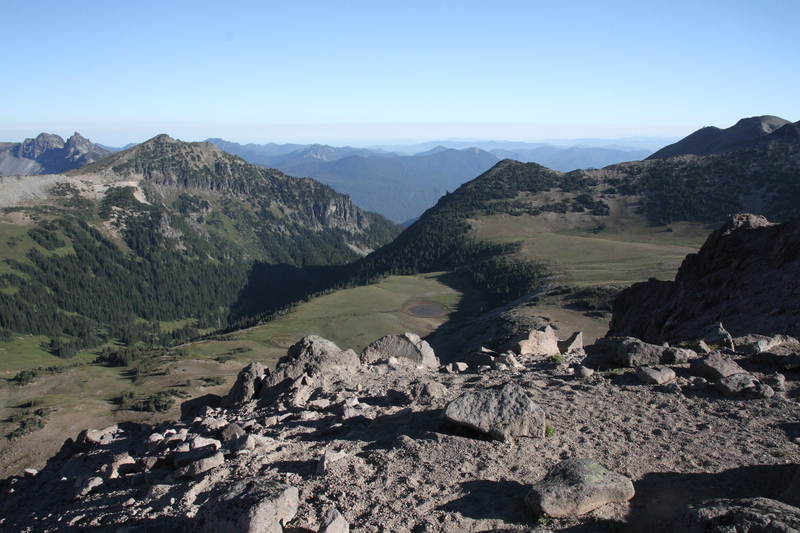 Whenever I describe a “mountain-top experience” in the future I will think of my time on Plummer Peak. My mountain top bench where I worshipped the Lord in the beauty of His splendor. One more “coincidence” that comes to mind. My goal when I set out was to get to the end of the maintained trail, snap some pictures, and come back down to head to Paradise. However as I neared the top of the maintained trail I met two photographers coming down. They had been up there to catch the sunrise from the top. One of them mentioned that he was on the top and got some good panoramas. Initially I assumed he meant the place I was headed. As I took pictures I realized he must have meant something higher. As great as the view was in the saddle, I become convinced by the experience this stranger on the trail shared that there was an even better place to aspire to, a higher place to attain. So I continued upward. I searched for the path heading higher. Our faith journey is like that. Our experiences of God’s grace shared with others is like the comments I heard from my fellow sojourner who had been somewhere I now desired to go. Because he shared a good word of what was attainable, I was encouraged to seek and find the path myself… a path blazed by others… a path that I would have struggled mightily to find if it wasn’t for those who had gone before me making a way. 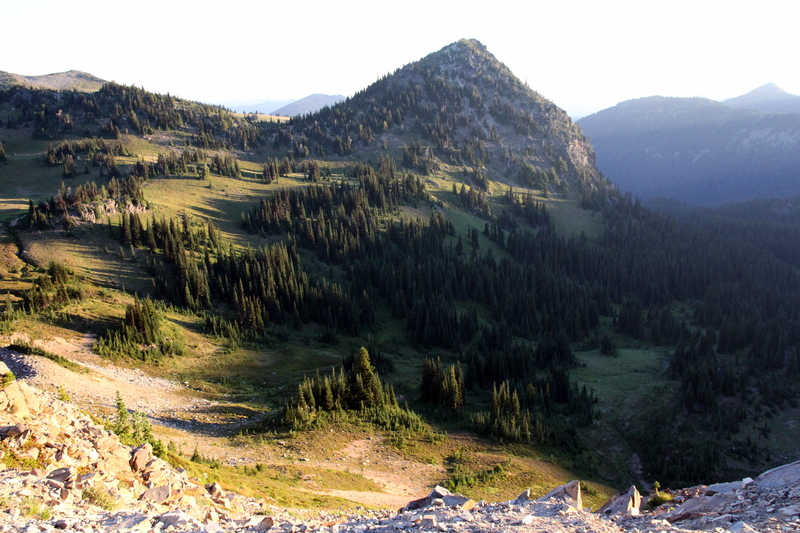 A view from the trail heading up the mountain to Plummer Peak. The shot above is toward the end of the maintained trail. For some folks this might look a little scary, but believe me, this is a super highway of a trail compared to what was ahead. As I entered the UNmaintainted trail area, there was enough of a path that I could find my way most of the time. I only lost the trail once in the high meadow about 100 yards below the summit. That final trail is a story in itself. Just below the high meadow the trail became very narrow and steep as it crossed a large scree field. One mis-step here and you would find yourself (or someone would find your body) hundreds of feet below. 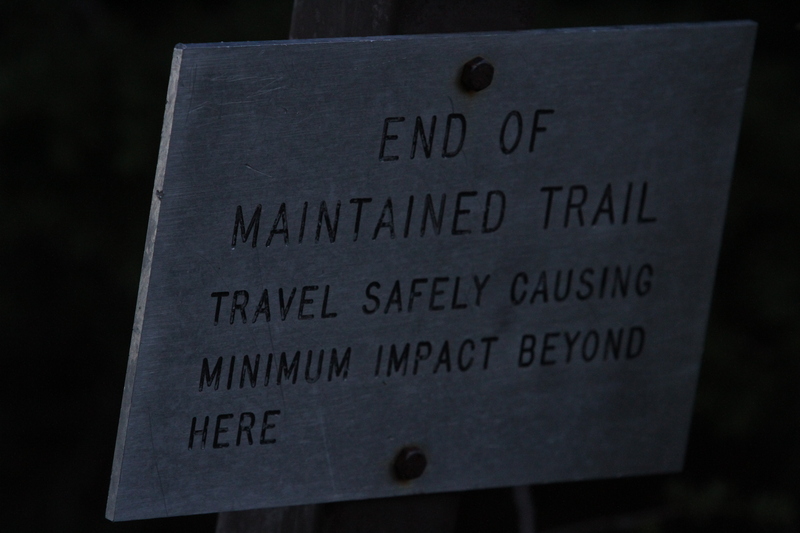 The trail had it’s dangers. 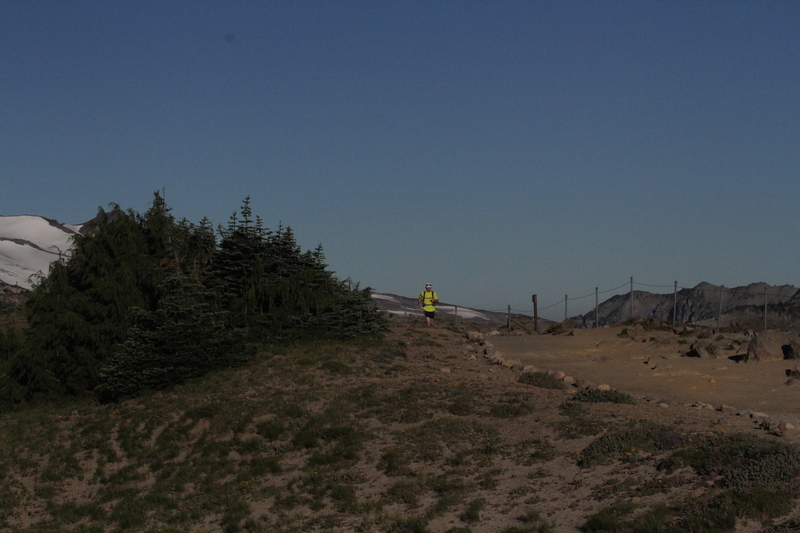 A shot of the scree field as I am about to cross it. 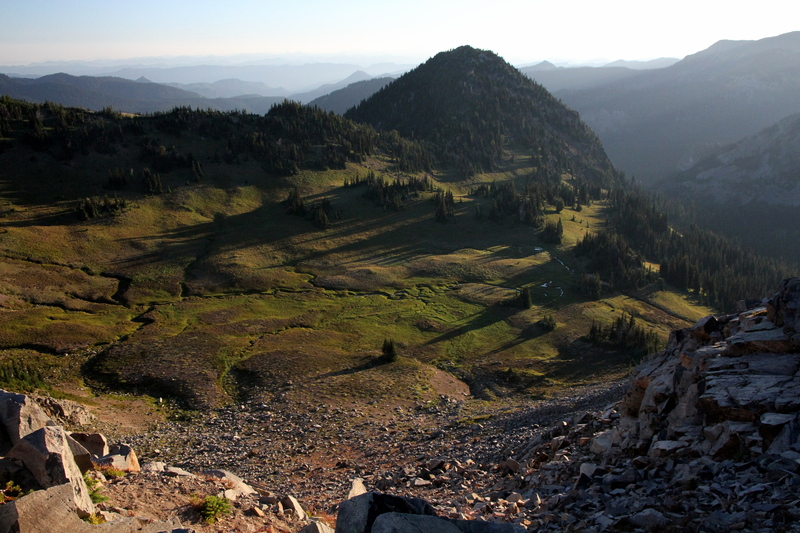 Above this scree field I entered a meadow that you could not see from below. 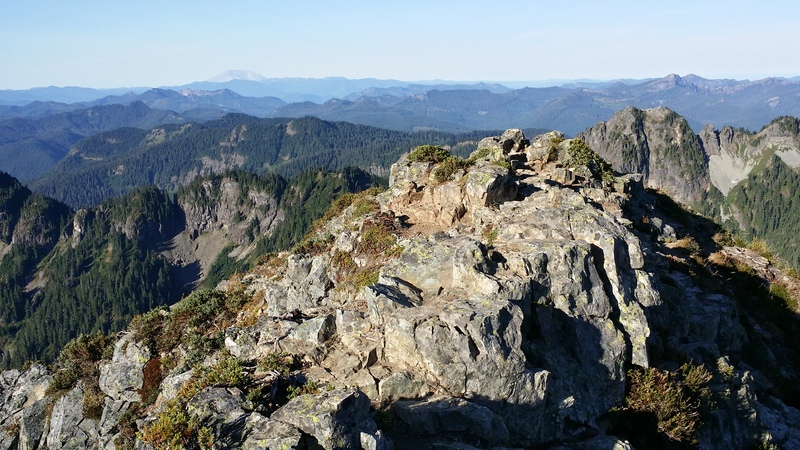 It was a beautiful place with a great view aimed at Mount Rainier and covered with plenty of bench-high rocks perfect for sitting and meditating. 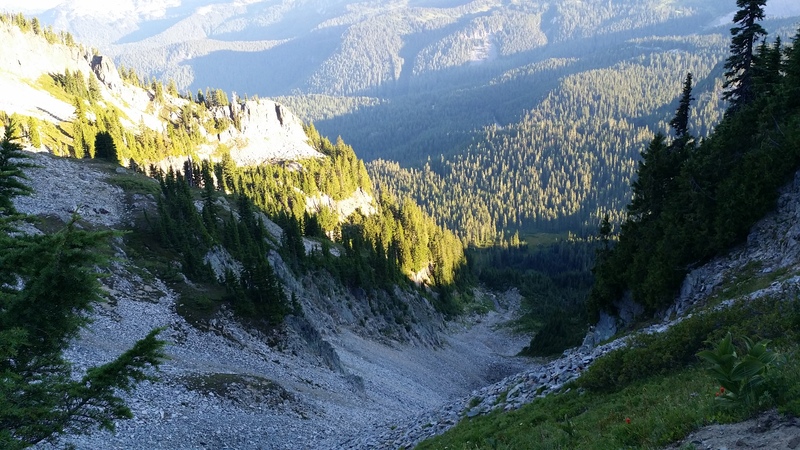 I got to a high place in the meadow and it appeared that the trail ended so I sat and talked to the Lord for a while. He spoke through the beauty and wonder of His creation all around me. It’s amazing how the fatigue and windedness almost immediately evaporated as I took in the stunning beauty. As I slipped on my pack and got ready to head down I glanced around and noticed what appeared to be a faint path leading higher. 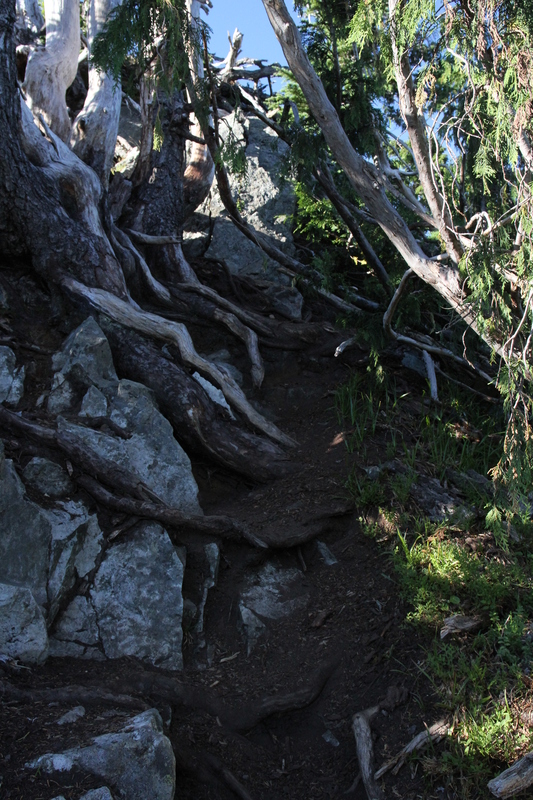 A hundred or so feet further on it became a distinct trail leading to the top. Refreshed from my rest and now excited to be heading higher again I pushed on toward the top. The final trail up to the peak. That is about a 300 foot drop off the left side of the trail. The right side was quite steep too, but not like the left. The final leg was very steep and not without a heightened awareness of the danger that lay close at hand. In fact that is one of the things that I noted several times over the weekend – a very real awareness of the danger, but without fear. Caution in the approach – yes, but fear was swallowed up in a faith that the Lord was with me leading and guiding every step. I carefully made my way toward the top on the path above. When I was within just a few yards of the finish the path was guarded / blocked by several dead trees. These snags show up all over. Because of the cool climate, the deterioration rate is rather slow so they may remain for dozens of years. These snags immediately brought to mind Dol Guldur, the evil lord’s castle in the Hobbit. But upon further consideration I decided they were simply guardians of a very special place. 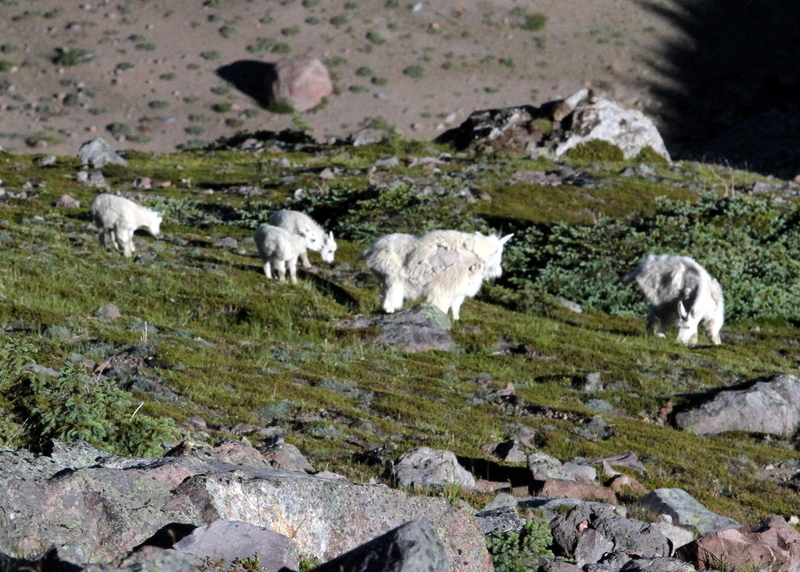 To slip through the closely spaced trunks I had to slip off my pack and lay down my trekking poles. Jesus said something very telling about slipping through a tight space in Matthew 19:24. “it is easier for a camel to go through the eye of a needle than for someone who is rich to enter the kingdom of God.” I had to leave my possessions outside to get through. 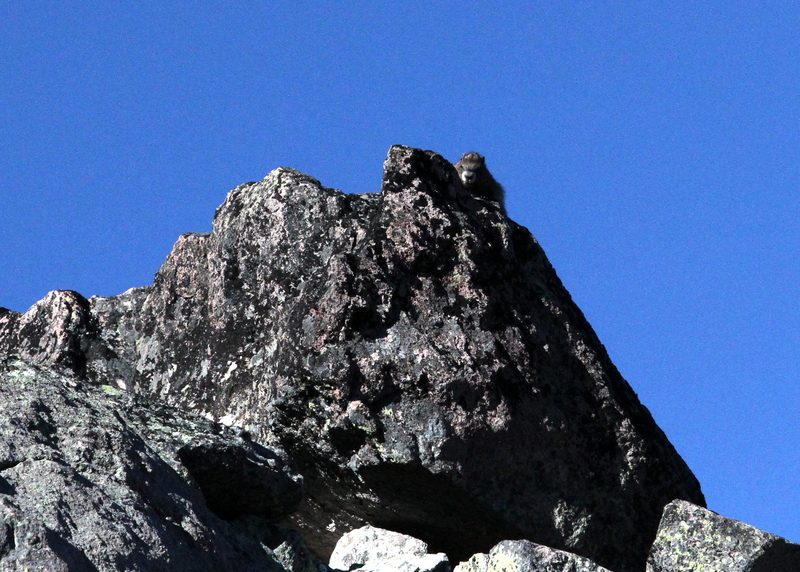 Guardians at the top of Plummer Peak. A view through the Guardians. Once through it was only a dozen or so steps to the top. I was mesmerized by the stunning view. 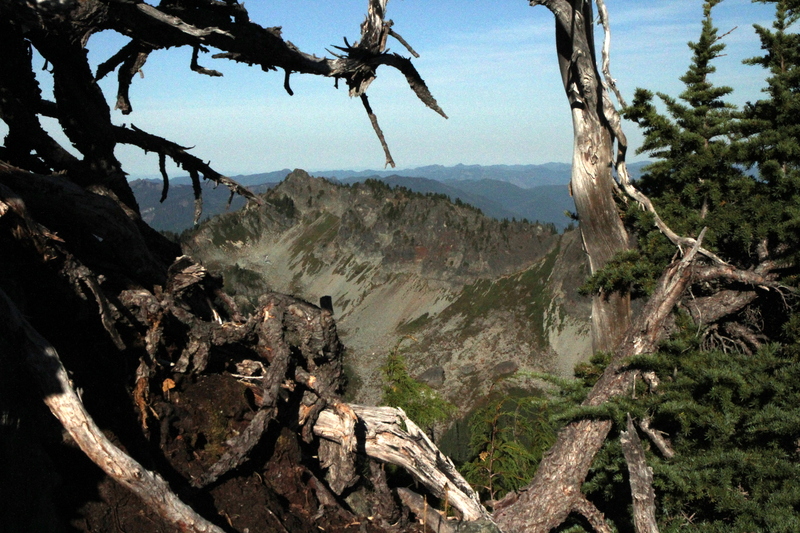 A 360 degree spin revealed jagged peaks, deep forested valleys, and the mighty mountain. The following are a few of those scenes. A view over the guardians. Pockets of snow still lingered. My friends here tell me the mountain I climbed usually still has snow at this time of the year. 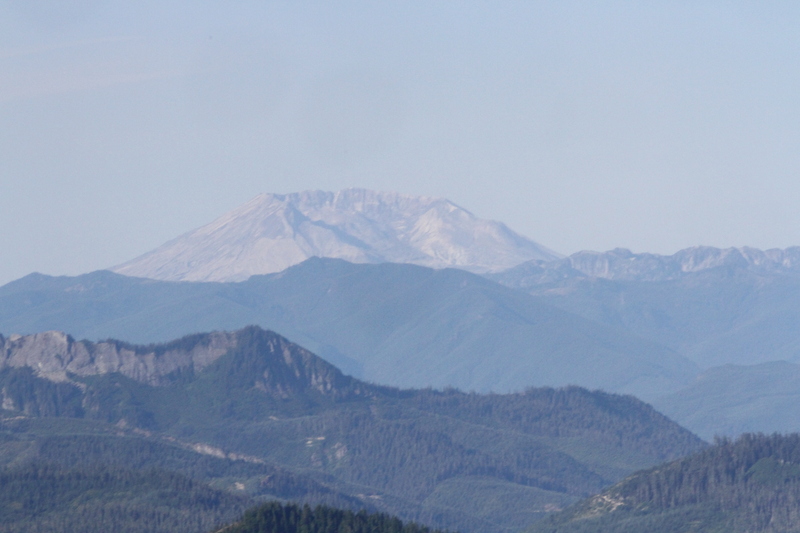 Mount St Helens which erupted in 1980. A view back down to where my hike started at Reflection Lake. A little over 1.5 miles by trail and a little less than 2000 feet below. 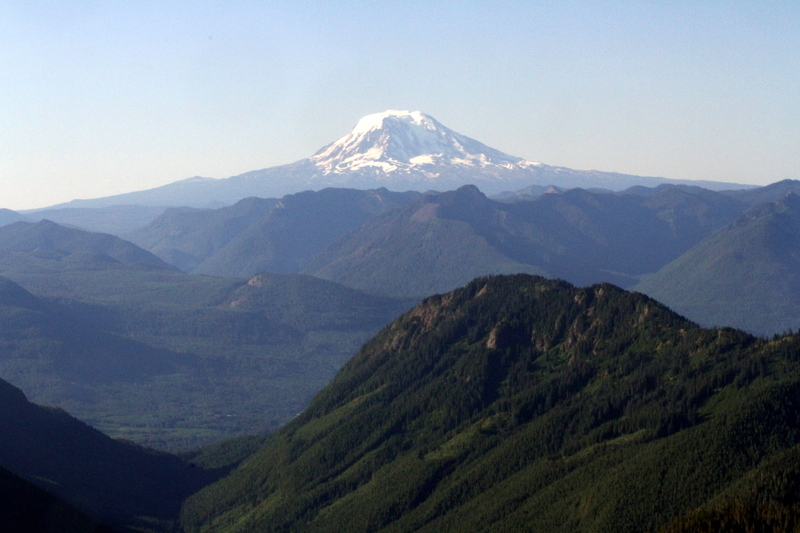 I’ll leave you today with this final shot of the mountain from the top of Plummer Peak. The time was around 7:30 – 8 am. The day was just starting and yet I was filled to overflowing with wonder. What a mighty and creative God we serve! If you like these pics stay tuned. 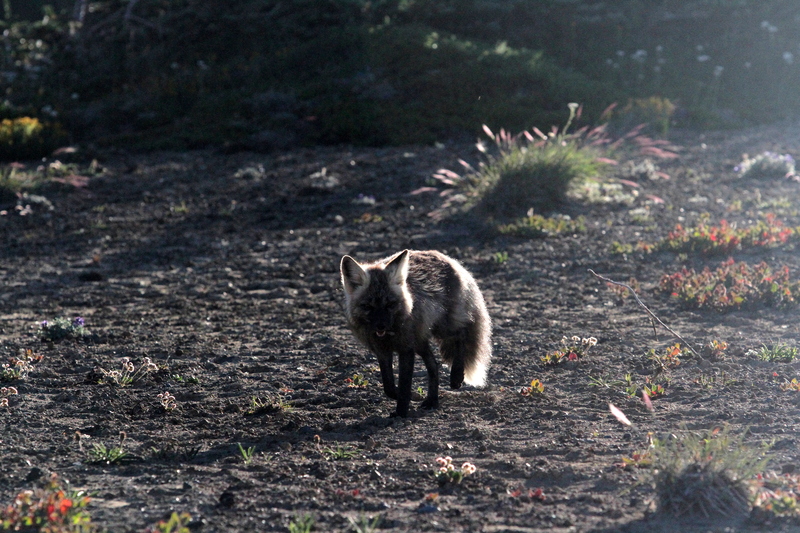 I have several other really good shots from the remaining time in Mount Rainier National Park to come.